You can generate multilanguage urls. With the built-in Translit feature you can also translit your urls to latin. Set a language prefix to your Urls, or include a language subfolder – its up to you. Once you define the template, the module will create all the urls for you when you create a new product, category, manufacturer or information. How much should the best Opencart seo url module cost? Congratulations! You have found the best Opencart SEO extension there is. So what? There hundreds Opencart SEO extensions on the market - you may say. Well, yes and no. There are literally hundreds of different SEO Extensions and modules on the Opencart Market offering basically the same thing - SEO URLs. And since they do the same, you would expect to choose simply by the price. Right? Wrong! The price actually won’t tell you anything when it comes to coding. Actually, the price is usually based on the developer’s feeling of the cost of his work. This, as you may understand, is very subjective and has nothing to do with the quality of the code. Every developer tries his best, no matter how much he prices his extension. So the price should definitely not be the criteria for selecting an Opencart SEO Extension. Why are opencart seo url so important? When selecting a SEO extension, you are usually looking for basic functionality, the one you learn from MOZ and SEOchat. The first thing that comes up are Meta tags for Opencart and SEO Urls, and it’s not a surprise. SEO urls are the core of good search engine optimization. Better to have less subfolders. Always use hyphens (-) instead of underscore (_). Opencart has a built in SEO Url functionality, yet it is extremely simple and can actually harm your SEO. Here are some issues that Opencart has with urls. SEO friendly Urls are coded in such a way, that you can get duplicate content easily, creating a hundreds of duplicate pages throughout your webshop. Opencart never made SEO urls unique, so you can have several SEO Urls for one and the same page. Opencart Adds SEO Urls only to Category, Product, Manufacturer and Information pages. It ignores such pages as Contact, Special, Cart etc. That is why so many opencart shops have ugly route=common/home in their Search Results. How to implement seo url in opencart? Implementing all these fixes and providing the support for proper SEO urls can be done the good clean way and also the bad ugly coded way. Most of the SEO extensions we have analyzed do it the bad way, adding the fix directly to the controller file with VQmod/OCmod. We can not say that the developers did this on purpose, it is simply because they lack the coding knowledge and foresight to do it the right way. What eventually happens is you add a third-party extension that also relies on SEO URLs and the two extensions collide creating a conflict. You spend money on developers that don’t actually make it better. They simple patch the conflict with another dirty code. But there is a better solution. You should not use OCmod directly in the Opencart code files, rather simply a call to your custom SEO Url controller. This custom controller runs before the core one and validates the URL. If it has something to return - it returns a result. If not - it passes on to the default one. No third-party conflict. Simple to implement. But we when even further. Instead of adding support for every extension we build separately, we created a an extensible SEO Url controller. So now all we need is a configuration file to add support for SEO URls. We believe in more for less. Less code, more functionality. SEO Module offers all the features you may find on the market and also extensibility, which is a unique feature introduced by Dreamvention. We use it for our other extensions like the Blog module, Ajax Filter SEO and Visual Designer Landing to implement their SEO Urls. 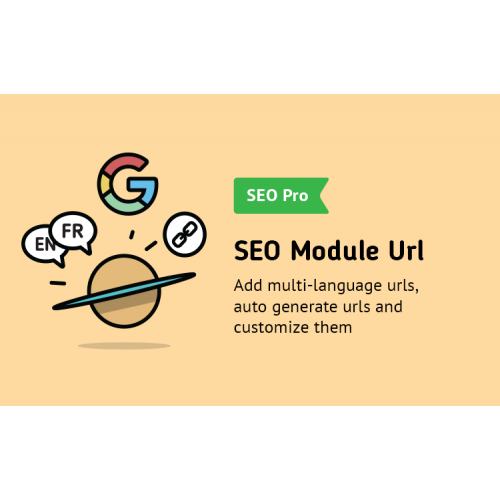 Because we don’t need to reimplement SEO Urls from module to module, we can focus on the core features, driving the cost down and increasing the quality of products we make. When purchasing our products you signal us that you support our cause of bring the best quality code for the lowest price. Support us and let’s create a better future for all Opencart Users.